But before we end this photo travelog, we must say that we were disappointed that we did not get to see any Grizzly Bears in Yellowstone National Park. Oh, we saw abundant wildlife, perhaps more than the average visitor, but Yellowstone is synoymous with Grizzly Bears. 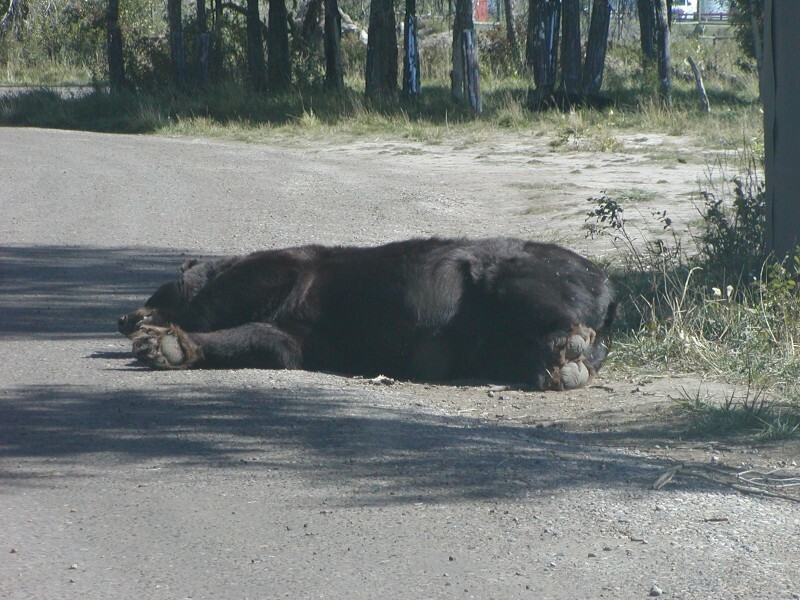 Unfortunately the highway that traverses their prime habitat was closed for road repair this season. So we had to visit a commercial Grizzly Bear Habitat just outside of West Yellowstone where we saw a dozen or more Grizzlies. But this big boar was the king of the bunch, a huge old bear. He was content to lay on his road as car after car passed him by, completely ignoring us.